Uses small-scale integrated circuits in dual-in-line (dil) packages and "Nixie"-type tube display. Capabilities - 4 functions. 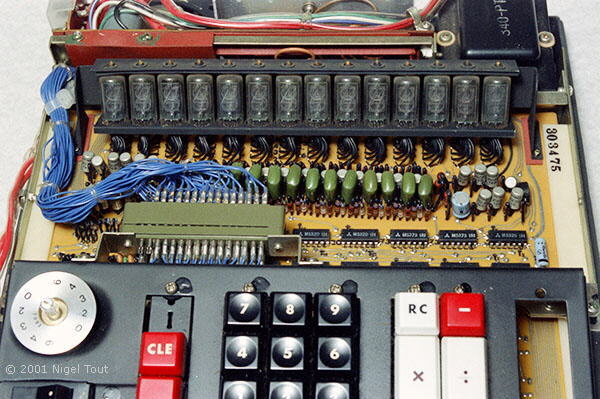 The knob at top left of the keyboard sets the fixed position of the decimal point. Display - 14 digits, "Nixie"-type tubes. Technology - Has two 10" x 9" boards and one 10" x 3" board carrying many mall-Scale Integrated-Circuits (SSI) in dual-in-line (dil) packages made by Mitsubishi. Size - 280 mm x 330 mm x 120 mm (11.0" x 13.0" x 4.7"), 5 Kg (11 lbs). Made in Japan, for Atvidaberg-Facit, Sweden. Dates from late 1960s/very early 1970s. 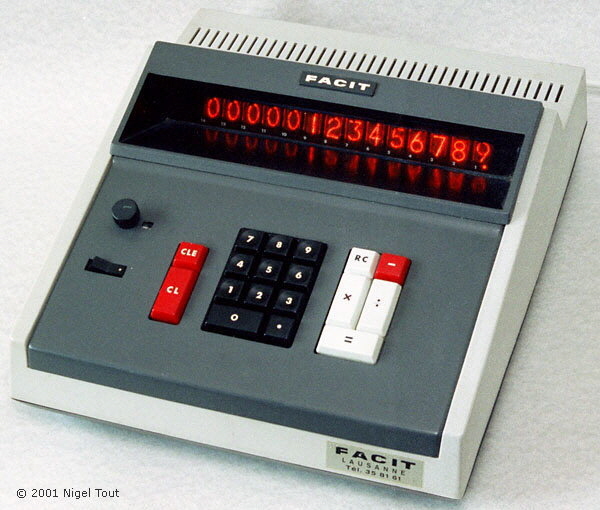 Facit were large producers of mechanical calculators, but their electronic calculators appear to have been made by others. In 1972 they were victims of the great drop in the price of electronic calculators and were taken over by Electrolux. 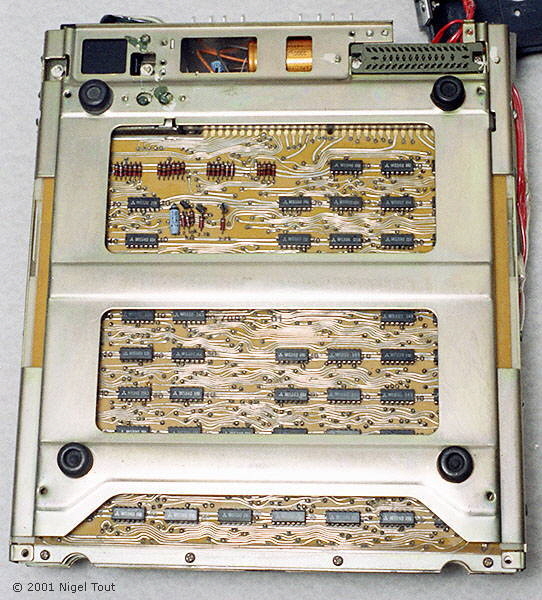 With the cover removed, showing the Nixie-type display tubes and the top, small, circuit board with integrated circuits in dual-inline (dil) packages. Close up of the display tubes and driver components. 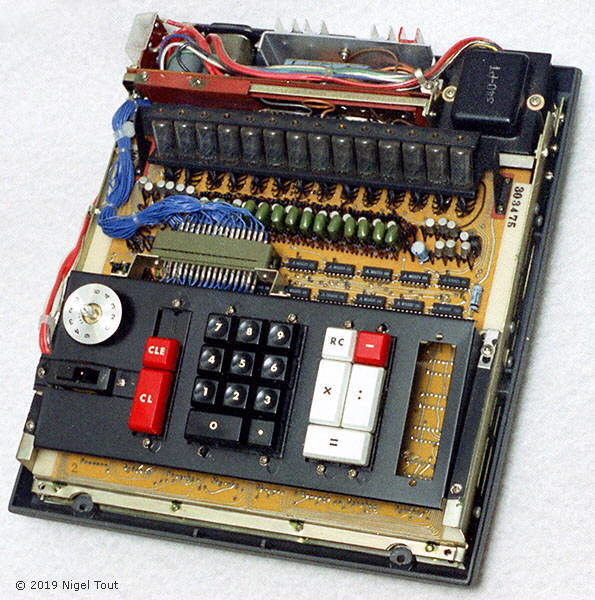 Underneath the calculator with the covers removed, showing the integrated circuits on the bottom circuit board. Brent Hilpert has brilliantly reverse-engineered the Facit 1123 and has published information and a simulator at https://web.archive.org/web/20161117071139/http://www.cs.ubc.ca:80/~hilpert/eec/misc/ftf/index.html.